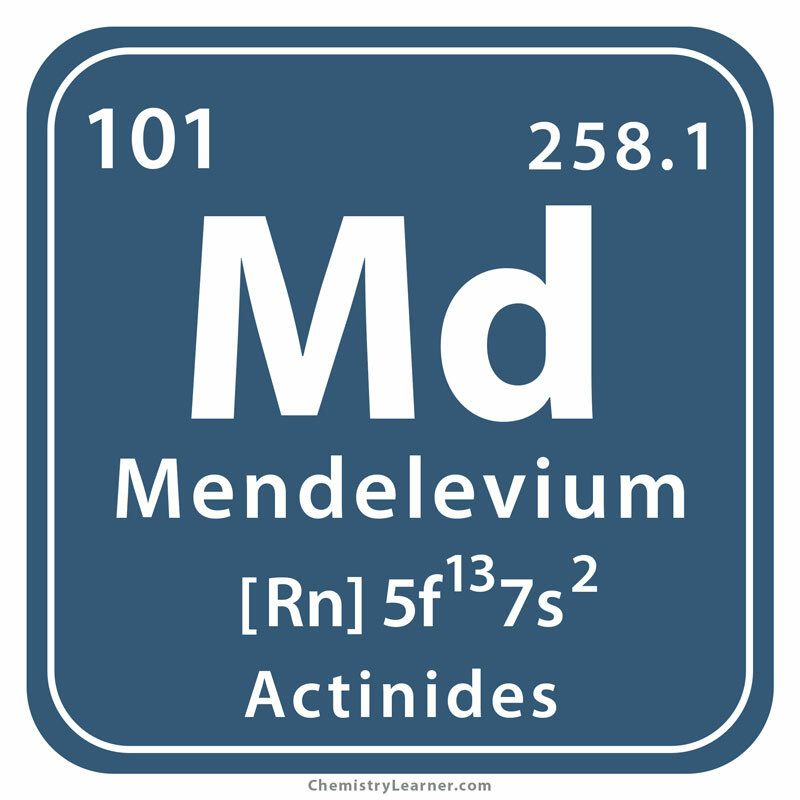 Mendelevium (pronounced as men-deh-LEE-vee-em) is a radioactive metal that belongs to the family of actinides and represented by the chemical symbol Md. Its most stable isotope is Md-258 with a half-life of 51.5 days [1, 4]. 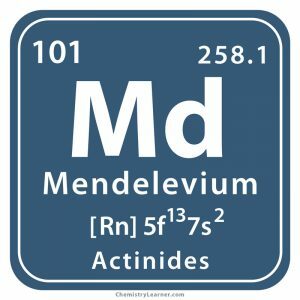 Origin of its Name: The element is named in honor of Dmitri Mendeleev, a Russian chemist who formulated one of the first periodic tables . Who Discovered it: Albert Ghiorso and his team of researchers comprising of Gregory Chopin, Bernard Harvey, Glenn Seaborg, and Stanley Thompson were responsible for its discovery . In 1955, Ghiorso and his team at Berkeley, California, conducted an all-night experiment where a sample of einsteinium-253 was bombarded with alpha particles in a cyclotron to produce a new isotope, later detected as mendelevium-256 with a half-life of about 78 minutes. After this, several other isotopes of the new metal were synthesized at the laboratory . 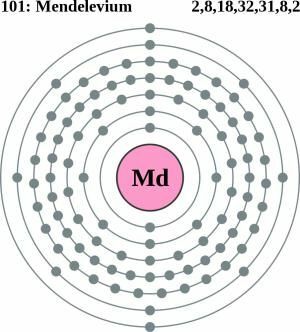 The short half-life of Md makes it difficult to study its properties in detail, and determine any uses. As a result, it is artificially synthesized whenever required for scientific studies . 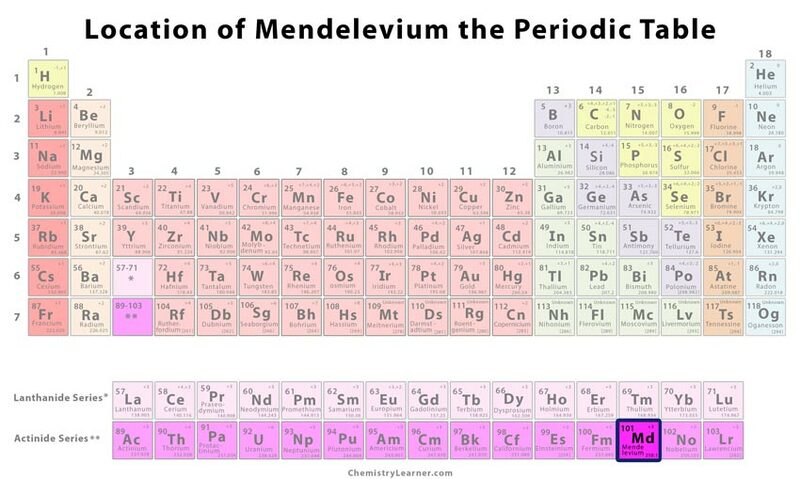 As naming the element after a Russian chemist was a bold decision taken in the middle of the Cold War, Glenn Seaborg had to take permission from the U.S government before officially declaring the discovery of mendelevium . The proposed symbol for the element was Mv, but IUPAC changed it to Md in 1957, at their assembly in Paris . Since the element is artificially prepared in the laboratory, it cannot be commercially availed.